In the post John Eales era there have been few players that Australia have relied more upon to deliver them success than Stephen Larkham. He has defined the way Australia play for the best part of a decade and for long periods of his career he set the standard internationally for fly half play. For a player who has influenced the outcome of so many games during his career it was tragic to see him retire without touching a ball after the ‘Miracle at Marseilles’. To look back on Larkham’s career is to look back on the rise and fall of the Wallabies at the turn of the millennium. If rugby indeed is played in cycles then Larkham’s career spanned a full one. From the depths of the 1997 defeat to Argentina to the highs of the 1999 World Cup and the first series defeat of the Lions in 2001, Larkham helped guide the Wallabies rise and fought to hold off the regrettable fall that resulted in the notoriously poor tour of the northern hemisphere in 2005. A superb playmaker who always attacked the advantage line, Larkham perfectly fitted the bill as the fly half to orchestrate new coach, MacQueen’s multiphase game play. A rugged and willing defender, Larkham was also the right man to step up to John Muggleton’s disciplined defensive structure. This defence famously held against all comers in the world cup bar the United States as the Wallabies marched on to victory and Muggleton’s work is credited with starting the world wide improvement in this area of the game. 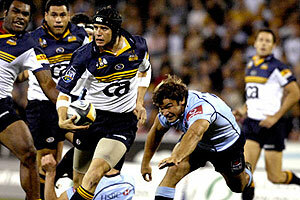 The first game of the 2000 Bledisloe Cup saw perhaps the best game of Larkham’s career. Having conceded 3 tries in the space of 7 minutes the Wallabies could have been expected to take in the shock that filled their supporters at the ground and in bars and lounge rooms around the world. Instead Larkham got down to business. With the first good ball the Wallabies had seen the fly half made a gap in the defence where there wasn’t one. Whatever the All Blacks could throw at them, Larkham refused to lose his head or concede an early defeat. As a playmaker this defiance was inspiring. Replays show there was only the slightest of misalignments in the All Black’s defensive line as Larkham loped towards them. With little more than a feint show of the ball and a shift of his shoulders he was passed the first line of defence and the game was alive. The play combined the two great traits that became synonymous with Larkham’s game; the ghosting run described above and the long flat pass, this time perfectly fed to a young Stirling Mortlock who raced away to finish the move with a try. That game, won at the death by a Jonah Lomu try, remains the best of the professional era and was arguably the last of its kind at an international level – when attack outweighed defence – before England made ten man rugby successful again. The 2001 Lions tour was the turning point for world rugby as phase play slowly gave way to the forward based game. Critical to the success of the British and Irish team was negating Larkham’s attacking threats. They set about achieving this with an aggressive attitude and a series of late challenges, memorably delivered through the elbow of Scott Quinnell, that took a heavy blow on Larkham and largely succeeded in taking him out of the series. Parallels were drawn with the bodyline tactics of yesteryear as attacking flair was sacrificed at the altar of success at all costs. Fortunately for Australia these tactics failed but the die was cast. At this point in Larkham’s career, with his importance to the success of his team so obviously acknowledged by the northern hemisphere teams, Australian rugby began its slow downward spiral. The departure of MacQueen and many of the team’s stalwarts was not well managed and nowhere was this more obvious than in the forwards. As the world rugby landscape changed Australia stood still, tenaciously clinging to the multiphase game plan as their opposition became bigger and stronger at the set piece. The criticality of Larkham’s role was further exasperated by Australia’s relatively small playing pool and lack of competition. By comparison, New Zealand, during the course of Larkham’s career, based teams around three vastly different world class fly halves; Carlos Spencer, Andrew Mehrtens and Daniel Carter. Snapping at the heals of these All Black greats were very competitive challengers like Tony Brown, Luke McAllister and Nick Evans amongst others. Larkham’s nearest competitor was the solid and reliable Elton Flatley, a player whose style was better adapted to the field position game preferred by England’s Clive Woodward and Flatley’s first Queensland Coach, John Connolly. As the trophies left the cabinet and the Wallabies lost their competitive edge Larkham slowly began to show that the years of wear and tear were taking their toll. The ghosting runs and cross-field passes were still their but they had lost their edge. Unfortunately, as his forward pack’s strength receded the tiring playmaker found himself under increasing pressure with less time to work the ball and no momentum to roll back the defensive line. Australian selectors foolishly positioned themselves between a rock and hard place. With a forward pack that were struggling to win possession it became more and more important that Larkham take the field to lead the backs but with Larkham always taking the field it allowed no opportunity for a successor to be trialled and a competitive environment at fly half to be established. The result was inevitable. The import of outside backs from rugby league did little to alter the downfall and was the equivalent of treating cancer with a handful of smarties. Bad ball became worse until finally, against Wales and England in 2005, the trickle was dammed completely and the Wallabies were humbled by teams with vastly inferior backlines but, more importantly, with vastly superior forward packs. The embarrassment of that tour prompted the events that led to the appointment of Connolly as Australian coach. This had the surprising flow on effect, given the Queenslander’s stated aim of focusing on the forwards, of reinvigorating Larkham’s rugby career. Connolly’s policy of creating competition for every jersey was to a large degree compromised by the pressure he felt to succeed at the world cup. The subject of much criticism, Connolly was however very successful in reigniting the careers of some of Australia’s older generation who had become too comfortable in their selections. 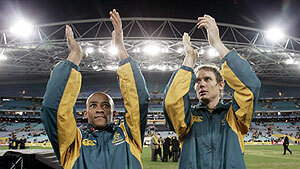 Larkham and his long time partner in the halves, George Gregan, were perhaps the two Wallabies who benefited most from this competition within the team and both players went into the world cup deserving their selection on form and no longer just on reputation. Entering his last world cup Larkham looked to have risen for one last glorious push. A victory over clear favourites New Zealand earlier in the year gave Australia hope but such hopes rested on one qualification; “we can win” the punters said, “but only if Larkham’s fit”. The surprising rise of Berrick Barnes during the campaign, so happily received by the Wallabies and their supporters, feels in some strange way an inadequate substitute for the opportunity of seeing one of our greatest and most influential Wallabies leave the international stage without being able to play his last hand. Like the departure of Ian Healy from cricket’s international arena, Larkham’s exit leaves us with an empty feeling and has robbed his many fans of the opportunity to acknowledge his contribution to Australian rugby in a fitting manner. Not in a tickertape parade of victory or even the bested efforts of a hard fought defeat will we remember his last moments in the green and gold but as a mere onlooker like the rest of us. As clichéd and over hyped as it may be, I will always remember Larkham for ‘that’ drop kick. Like Shane Warne’s ‘Gatting Ball’, Larkham’s field goal against South Africa in the 1999 rugby world cup will remain forever tied to any memories of his career. Although not representative of what made him the great player he was, it was the play that made him. From then on he was and will always remain a great Wallaby. Enjoy this article? We encourage you to send it to a few friends and spread the word.